Tulips are one of the most popular bulbs to give a fresh, vibrant spring colour to your garden. They also make great cut flowers to brighten up the house. Supplied as a pack of 10 bulbs, ready for planting. The wonderful colour combination of beautiful blush-pink petals brushed with stripes of pastel-green, makes an ever-so pretty contrast on a delicate looking but totally hardy spring flower. A florist favourite, their long-lasting blooms say prestine long after being cut which makes them ideal for creating stunning indoor vase displays on windowsills - or why not give a bunch to friends or family? 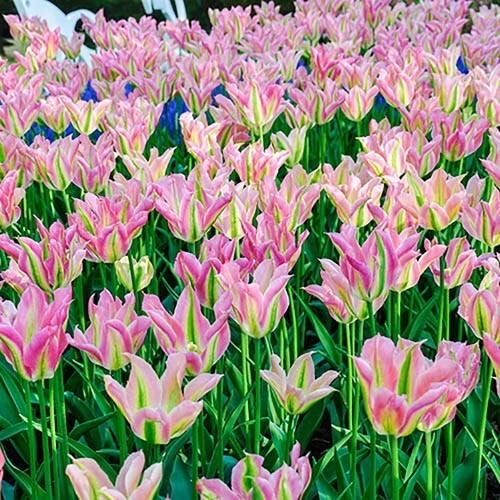 It's not hard to see why tulips are one of the most popular spring bulbs thanks to their lasting flowers, vigorous growth and versatile nature. They are perfect for planting with many different colour variations to give fresh, vibrant spring colour to your garden, patio or decking, but they also make beautiful features in pots in large displays of the same variety. Plant in autumn for stunning spring displays. Supplied as a pack of 15 bulbs, ready for planting.